I am very pleased to present the latest quilt in the Sew Karen-ly Created...pattern line. With Glowing Hearts © has been in production for some time and is now ready for sale. 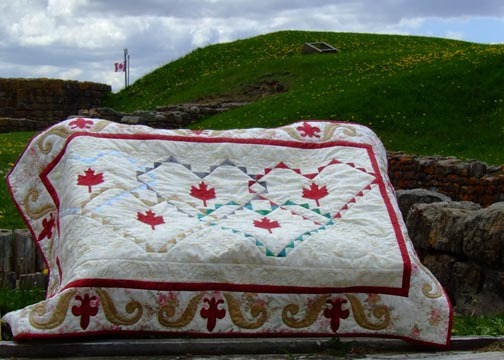 Patchwork and appliqué combine in a patriotic mix of maple leaf and fleur-de-lis motifs. The design idea began during the Olympic fever of our past year. The linked rings in the Olympic logo became hearts to echo a line from our national anthem ("With glowing hearts, we see thee rise" is quilted in the inner border in the sample quilt). The colours chosen for the hearts reflect not only our winning Olympic spirit but also a bit of Canadiana: blue for water, sky, and our French heritage; black for Cape Breton coal and Alberta oil; green for our forests; red for our maple leaf and flag; gold for wheat, maple syrup and of course, as the commodity immortalized in Robert Service's "Spell of the Yukon". As always, I am grateful for the help of Lynn Bourgeois for her assistance in pattern editing. 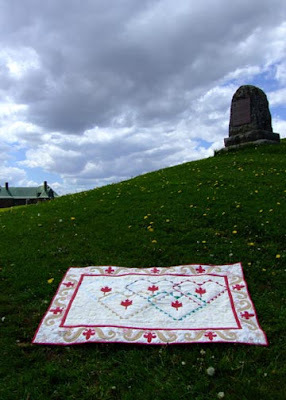 "With Glowing Hearts" was photographed at Fort Beausejour, N.B. 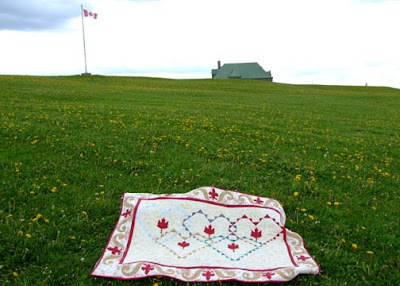 National Historic Park, a perfect location to shoot this quilt as the fort was used by both French and British troops (who changed the name to Fort Cumberland) during the early days of Canada. Anyone who has visited this location will tell you how windy it is (a great spot to fly kites!) and on another day I will post "out-takes" from the photo shoot. It was no easy thing to have that quilt stay in place long enough to snap the shutter. Hubby and I chased it over a lot of ground to get these pictures! Fort Beausejour is one of my absolute favourite places to visit; officially the site opens tomorrow but there were many visitors there this past weekend including a family from P.E.I. who asked to take photos of the quilt also. That was a nice compliment. The pattern for With Glowing Hearts © retails for $10.95. 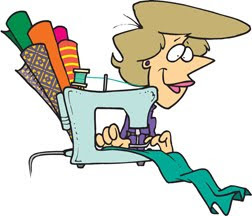 There's lots of time to get it sewn before Canada Day! 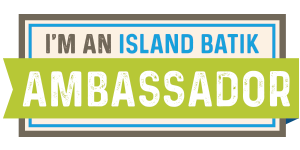 Please ask at your local quilt shop, or send an email to order directly from this site with a credit card. The pattern has not been added to the checkout as yet, but will be shortly. Timeless Stitches Quilt Shop in River John is well stocked with the pattern so stop in and have a look! I couldn't resist this skein, aptly entitled "Yummy" by Fibranatura, a super soft Merino wool. My favourite shades of blue and green with a little mauve mixed in will be a pleasure to knit. Admittedly, this yarn was a bit of an indulgence for a practical girl like me but...won't they be gorgeous? 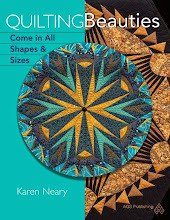 Inside this magazine is a review and excerpt from Canadian Heritage Quilting. Then it was off to check on the bees who were happily at work in the sunshine. A good day for all. Marg is zipping right along with hers and already has the outer blocks foundation pieced and ready to add. As Jeanne says, these will be "delicious" when finished. I can hardly wait to see how they choose to quilt them. 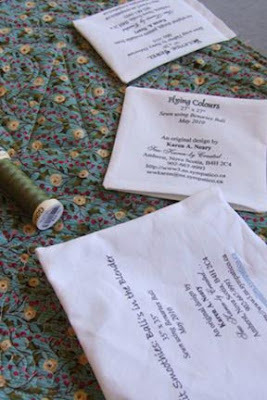 The pattern for Farrago is available here if you'd like to make your own. I realize I'm a bit biased...but aren't they gorgeous? The Neary Apiarists have been busy splitting hives and installing new queens for these new colonies. The process is a fairly straightforward one but rather time consuming. 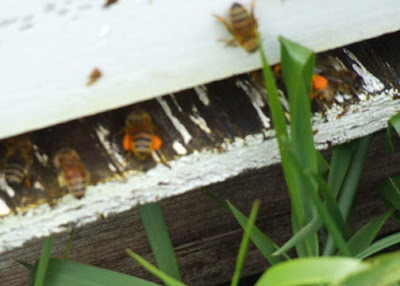 First off, you need to locate the current queen bee in the hive you are splitting. It's harder than playing "Where's Waldo" because in this scenario, everyone is wearing a striped shirt...Each frame is scrutinized one by one and if after examining each frame you haven't found her, you start over. It would not do to put both old and new queen in the same box and leave the other box queenless. Hubby is particularly good at queen spotting. We transport a couple of the crates at a time to the beeyard. Here you can see they are afforded the respect they deserve, with a special carrying place in the dash. They like to be kept warm. ...or not there at all - frustrating! 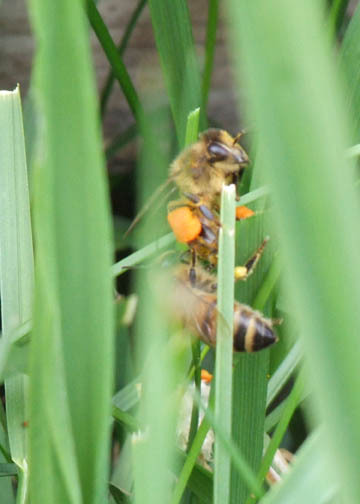 Here are a few shots of the pollen sacs on the worker's legs. 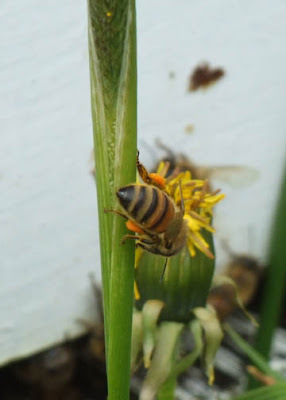 Since they don't have backpacks or buckets to carry home the pollen they collect, they store it in little pouches on their thighs (hmm...do bees have thighs?). Depending on where they have visited, their cargo can be yellow or bright orange. Visitors to dandelions usually come away with orange booty. 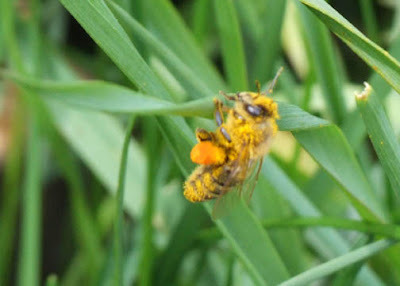 The colour of the pollen collected is reflected in the shade of the honey which comes off in the fall. This is why honey made from white clover blossoms, for example, is lighter in colour than say a honey produced from a mix of wildflower pollens. This worker has shoulder bags: Here you see them arriving back at the hive and heading in to store their cache. Some of these little workers are really loaded down. Often in spring the entrance will be stained yellow or orange; you can see a bit of yellow here. As the hives are rented for pollination, this weekend we will move the hives into blueberry fields. Heavy work, and I'm always glad when this part is behind us. ...and matching stripes in the fabric pattern. 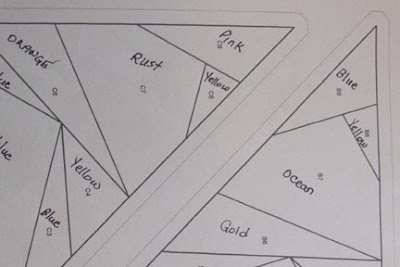 All of the projects required bias binding for their funky shapes. I do like odd-shaped quilts. It was a wild week with fabric flying everywhere. Sometime mid week, I lost my pin cushion and didn't want to take the time to stop and look so soldiered on with about 6 pins. I conscripted the household into helping. Eldest son did the computer work and made simple fabric labels for the backs, as well as the shipping labels and paperwork required to ship the package through U.S. Customs. Just to add a bit of drama to the week, youngest son's contribution was to arrive home with nasty cold germs from school. We limped along a bit slower because of that, but just as determined. Murphy's Law also dictated several other technical difficulties which were dealt with as best as possible. 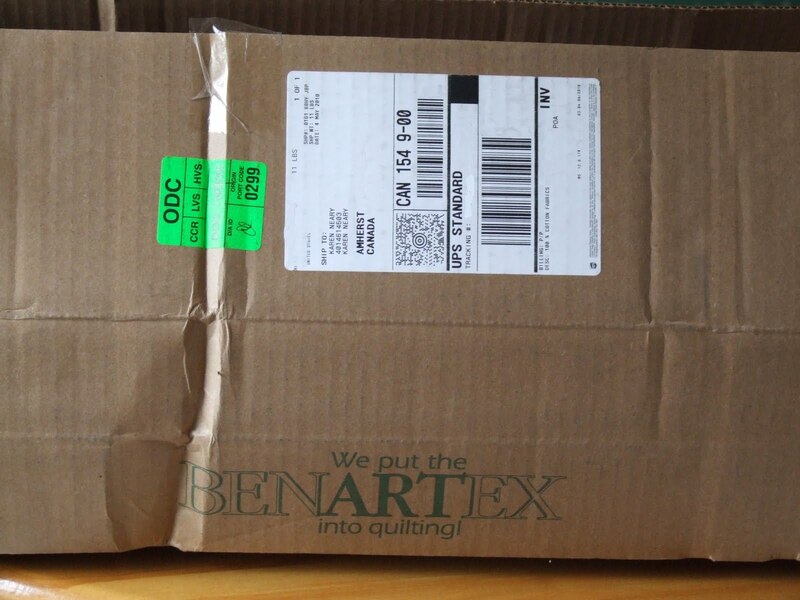 When the UPS man left yesterday afternoon, he took with him 3 completed quilts headed for the Benartex booth in Minneapolis. In hindsight, I would change up some of the colour placements and design decisions, but under the circumstances I am happy with the results. As per my post on Quilter's Net earlier this week, my reward for finishing was to order the latest Chuck Palahniuk novel, Tell-All. In the aftermath of cleaning up, I found my pincushion buried under a pile of bindings. All is well. "Oh, What a Feeling! What a Rush! and a bunch of new queens for the hives we will split into two. Lots to do, plus time to pause and celebrate Mother's Day. Whew! However, by last night 3 hives were split (into 6) and one quilt top was completed. It's easy to let ourselves get overwhelmed by too much, but there are strategies we can use to make things easier on ourselves...most of which I've learned the hard way! Bev Crouse at Quilter's Net has asked me to write a post for her newsletter on Time Management. 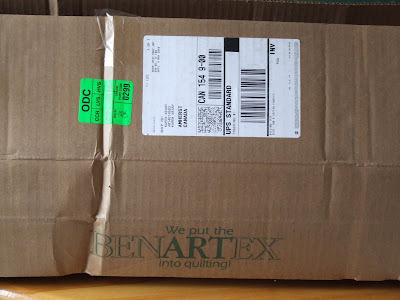 If you would like to read my quilter-oriented suggestions for fitting everything-and-then-some into your day, click here to sign up to receive the post. I am off to baste and quilt. The fabric is s-o-o-o gorgeous. Naturally, I started with the balis! The Nova Scotia Fibre Arts Festival website has been updated, and events for this year are posted here. I will be presenting two workshops that week (same topic on 2 different days), Wednesday October 13th and Friday October 15th, from 9-3 pm. 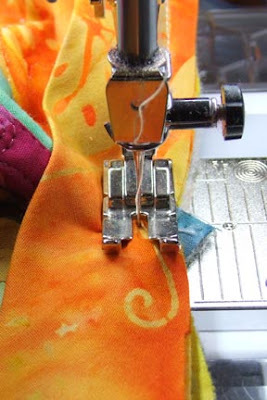 The focus of the workshops will be on successful machine appliqué. 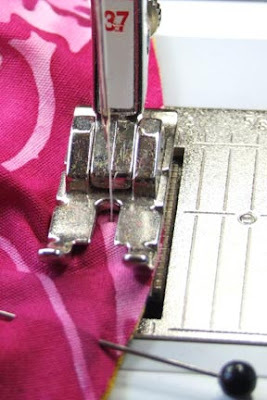 If you've attended one of my classes before, you'll know there will be lots of sewn samples to illustrate the different techniques we will cover. 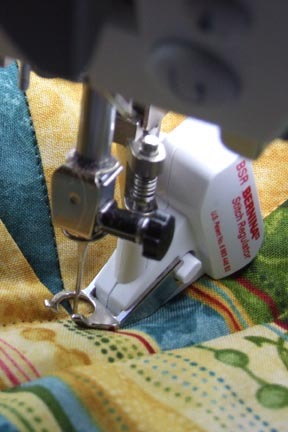 The workshop is hosted by the Cumberland Quilt Guild; enquires may be made directly to the registrar, Sharon Snook. If you are thinking of attending, best to get your name in quickly as the classes fill fast. Hope to see you there! Click on the arrow to hear how the bees sounded this afternoon. They are enjoying our spring weather a great deal! 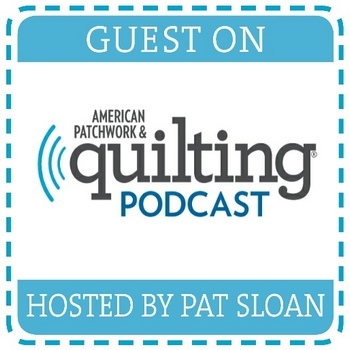 There's an even louder buzz among quilters about the upcoming release of EQ7. I've been a dedicated user of EQ since the beginning, upgrading through each of their versions. I remember thinking when EQ3 was released that it was the ultimate, but have been truly wowed by each successive release. I can hardly wait to see what has been added this time. Our 5 month anniversary of sewing together is coming up, so I bought my beloved Bernina a present to mark the occasion - a # 24 Freehand Embroidery Foot. The Bernina Lady was passing through town on Thursday so she brought along the foot. It's a dandy.